I'm so excited that this year, Christmas has come early to my house. I am finally a proud iPad owner! Couple that with my smartphone and I'm a tech geek to be reckoned with. :geek: There's not an app I can't download or task that I can't accomplish now. Of course, all of this technological prowess needs to be harnessed while on the go and when I need to be completely hands-free. I've used several cradle-type devices in the past, but have always ended up picking my pricey gadget off the floor several times. Is there anything on the market which will successfully secure your iPad or smartphone when it's not feasible to hold it yourself? Let me introduce you to the iMagnet mount! Smartphone Mount which retails for $59.99, but is currently on sale for $19.99 with FREE SHIPPING. iPad Mount which retails for $99.99, but is currently on sale for $49.99 with FREE SHIPPING. Receive 10% OFF your Amazon order of either the Smartphone mount or the iPad Mount from iMagnet with coupon code "3WYWEK9U"
When I get into my car each day, my cell phone is one of the first things I have to fiddle with. Although my Roadster automatically pairs, thanks to the magic of Bluetooth, my cell phone isn't ready to roll because I need to try and secure it in it's cradle. I tried using a cradle that suctioned to my dash or windshield, but after dropping my expensive device and it landing under my feet a few times, I gave that option up. That led me to try a gooseneck cradle which sits snugly in one of my cup holders, but unfortunately, the gooseneck often bends and droops with the weight of my phone and again, I'm left picking up my phone off the floorboard of my car. The iMagnet Smartphone Mount is ridiculously quick and easy to install and actually stays put. The specialized sticky suction cup on the bottom of this magnetic mount is twice as strong as a traditional suction cup, so that you can easily mount this device wherever's the most convenient for you. The best part of the iMagnet mount is that there are no cradles or other adjustable pieces involved. Simply place the magnet inside your cell phone's protective case and voila! 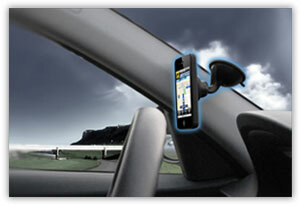 Now you can just hold the cell phone close to the mount and it will automatically snap securely into place. I've been driving with the iMagnet Smartphone Mount for over a week now and can report that it has truly stayed put and hasn't once dropped my phone onto the floor. I also love how quickly I can get moving, for when I sit down in my car, it takes just seconds to snap my phone into place. The iPad Mount from iMagnet works just as easily. Simply slide the large circular magnet inside the included clear case or inside a protective iPad case of your choosing. Then watch as your iPad is held securely to the magnetic mount. Now you can attach it anywhere for quick and easy viewing. 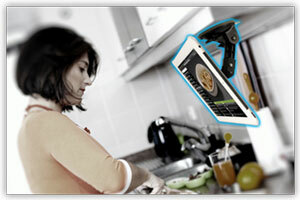 Personally, I love using the iMagnet iPad Mount in my kitchen because it turns my iPad into an instant cookbook. I can even watch cooking demonstration videos on it so that I can master the latest techniques. FINALLY, I can try all of those delicious recipes I see on Pinterest, quickly and easily! The only downside I've noticed with the iPad Mount is that it isn't very compatible with the OtterBox Defender iPad case, which I own and use to protect my iPad from anything and everything. You see, the magnet included with the iPad Mount has a fairly small hole cut in the center, while the back of my OtterBox case has a larger hole. This makes it so that the magnet from the iPad Mount is seen through the Otter Box case, thus losing the sleekness of the case's design. If the hole of the magnet and probably the magnet itself were made a little larger in diameter, this problem could be fixed. Both the smartphone and iPad mounts from iMagnet worked very well and were so easy to both install and use. The sticky suction cup attachment is strong and secure and holds much better than a traditional suction cup. Also, you no longer have to worry with those ridiculous cradles...just snap and go! Almost everyone has a smartphone or iPad these days, and if you're searching for a gift that's sure to be a hit, then be sure to pick up a mount from iMagnet! 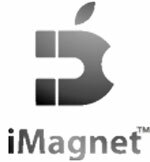 Disclosure: I received the Magnetic Mount for both the Smartphone and the iPad from iMagnet in order to facilitate my review. No other compensation was received. This product review is based on my own personal experiences with this item and is completely honest and objective. 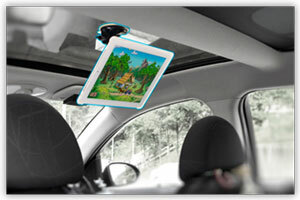 We would most like to use their magnetic mounts in the car and in the kitchen. Definitely in my car for my iphone. We’d use it in the kitchen! We use our iPad for cooking all the time. I would love to use this for the car. Would be a much safer alternative to holding my phone in my hand or on my lap to look for directions. Thanks for the opportunity. I would use it in my son’s sensory room. I’d like to use it in the car for GPS. I would put it in the kitchen! I could use it in my room on the night stand. I would use it in the kitchen or the living room. What a cool idea! Thanks! In my car would get the most use. I would use it in the car! I will use it in my car. God bless! In my car, of course! would be perfect for my gps. Would love it in my car. This would be great to use in the kitchen for following recipes. In the car mostly, sometimes in the kitchen. I love that it’s so adjustable. I think it would find a lot of use in the kitchen. I’d use it in the kitchen. Do you think the iPad one would work with a Kindle Fire?